It could be a set out of What Dreams May Come, as Robin Williams wanders the sewers of Hell. Or it could be a bullet on a page of Ten Temples You Should See Before You Die. This apparition rises from the fruit fields on the road to Chiang Rai in northern Thailand almost like a crystal cathedral off the San Diego Freeway. The only thing it lacks is an angry preacher. 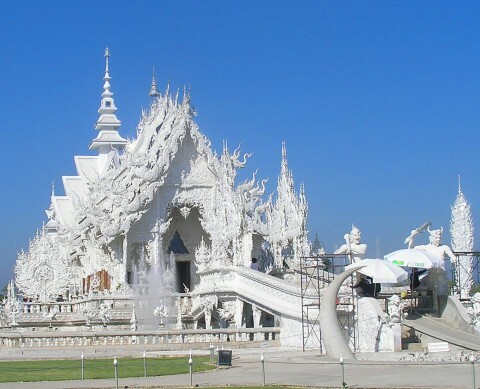 Wat Rong Khun, or White Temple, is a spectacle in the middle of nowhere. Perhaps it is the very definition of the nirvana it is trying to capture – a blinding enlightenment coming from the patience, perseverance, and vision of one man: artist Chalermchai Kositpipat. Thirteen years in the making so far, the temple is part of a sprawling, six-acre complex of white paint and mirrored glass with a bridge that passes over a sculpted river of grotesque figures of sin and suffering to get to the ubosot, or assembly hall — one of the three main structures in this creation to date. Day or night Wat Rong Khun is a splendid display of imagination that plays upon the sunlight and moonlight with sparkling reflections, enhanced by a menagerie of creatures amid calm ponds. Kositpipat, a devout Buddhist of 55 who sold paintings for 20 years to launch the project, got to work on the Wat with a small army of disciples 1998. And he is taking until eternity – or 2070, he projects – to get the job done. Completion calls for nine equally painstakingly ornate white buildings, including a crematorium, each with a grand lesson in morality to teach. Most Buddhist temples pay homage to the life of Buddha in colorful images of lotus blooms and monsters that depict the faces, lessons and ascent of the master of enlightenment. The murals in this ubosot read like a painted alleyway in Hollywood. Red skull traffic cones line the road like so many Halloween candles. And once past the river of writhing hands and body parts the temple walls depict images of whores, alcohol, cigarettes and all manor of vice, plus New York cityscapes, weapons, spaceships, even Superman and Neo from Matrix – basically whatever seemed to come into Kositpipat’s brain from the headlines of the day. A sign posted boldly on the gift shop wall reads, “Wat Rong Khun is a Buddhist place of worship and unfortunately, due to many incidents of inappropriate behavior, our foreign visitors will not be permitted to enter the temple without your guide.” But a bored guard at the door to the hall hardly pays attention to the sad sign. Entry is free and a gift shop sells artful T-shirts and the artist’s prints. Or there are the bottles of Mao berry juice, honey and fresh fried worms to be purchased next door. This entry was posted in Thailand and tagged Wat Rong Khun, White Temple, White Temple in Thailand.